Heartsleeves is behind this artistic gate on Fir St.
Let me start with the bottom line: Please visit Heartsleeves Coffee in San Diego’s Little Italy. 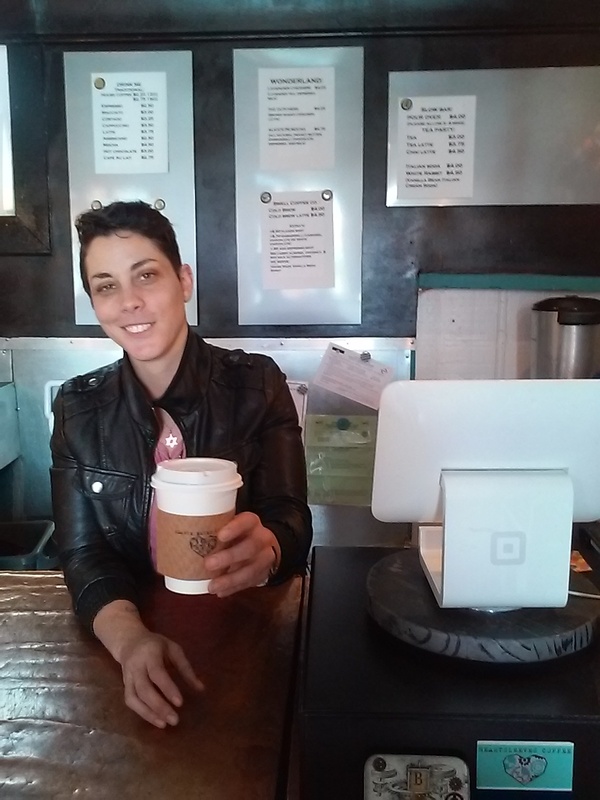 Small, up-and-coming coffee shops need your support. Heartsleeves Coffee’s decor reflects the sole proprietor’s interest in Alice in Wonderland, vintage keys, and gears. Take a moment to look at her interesting items on display. There are outside tables and chairs with a few umbrellas and free wifi. It’s a great spot for kicking back and enjoying a little historic ambiance. It is located in the historic Fir Street Cottages area and set back from the street so you may have to search it out rather than notice it as you are strolling by. Heartsleeves Coffee serves up a delicious cup of coffee using Swell Coffee Company beans. Swell is a local roaster with locations in Mission Beach and Del Mar (www.swellcoffeeco.com). You’ll also find pastry, scones, and chocolates to go with your coffee. Parking in Little Italy is always a challenge with a variety of parking ranging from free to meters. Read the posted signs carefully as they change from block to block. The day we visited there was a grumpy dude giving out parking tickets. You have been warned, but don’t let that interfere with your desire to enjoy this area and this coffee shop. 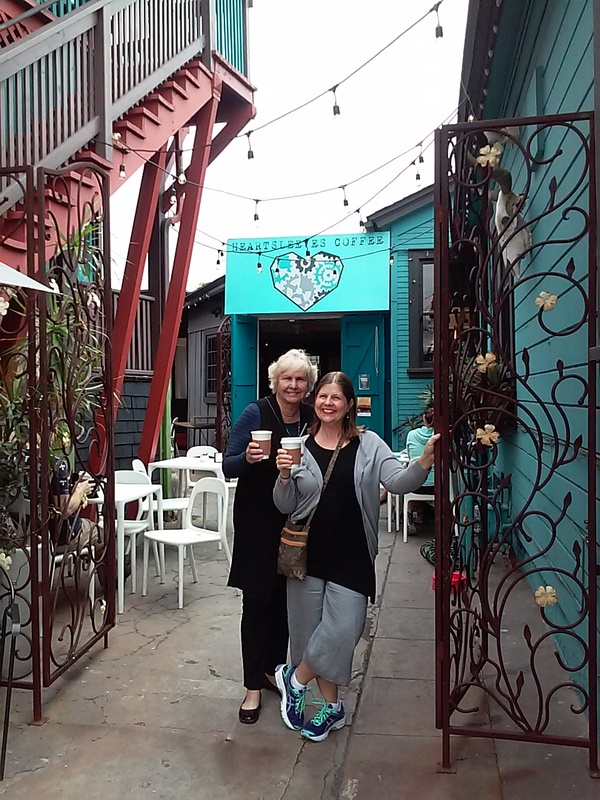 We visited Heartsleeves Coffee to meet up with our bud Anita who is visiting from Texas and staying in Little Italy. 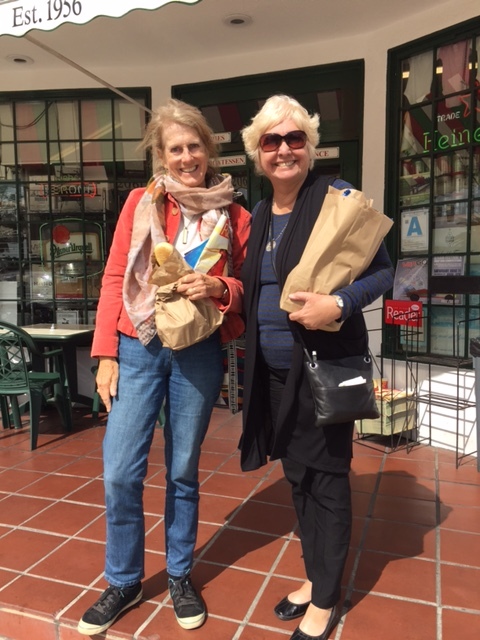 After our lovely cup of Heartsleeves coffee we headed to nearby Mona Lisa to get some fresh pasta sauce, noodles, and fresh bread to take home. Yum! Mona Lisa Italian Foods (www.monalisalittleitaly.com) is both a full service restaurant and a deli. The first Mona Lisa Restaurant was established in 1956. It’s a landmark, definitely worth a visit, and they have free parking right in front of the store. Little Italy is one of San Diego’s treasures. There are numerous interesting coffee shops, restaurants, and stores to explore, but next time you are in the area, try out our combo of Heartsleeves Coffee followed by a visit to Mona Lisa Italian Foods. Dinner tonight: fresh sauce, pasta, & bread from Mona Lisa! Gallery | This entry was posted in Coffee shops in Little Italy, Italian food and tagged Little Italy, Swell Coffee. Bookmark the permalink.